The international nongovernment organization Action Against Hunger, together with partner restaurants and top chefs are bringing to life the Restaurants Against Hunger campaign this holiday season. This movement aims to save the lives of malnourished children in the Philippines through ‘DISHES THAT FEED MORE’ in participating restaurants. When ordered, proceeds from these dishes go to Action Against Hunger’s programs in alleviating extreme malnutrition across the country. For almost 40 years, across nearly 50 countries, Action Against Hunger has led the global fight against hunger. They are committed to ending world hunger, work to save the lives of malnourished children while providing communities with access to safe water and sustainable solutions to hunger. They ensure that the marginalized and most at risk have access to clean water, food, training and healthcare. They enable communities to be free from hunger. In the Philippines, Action Against Hunger has helped more than 500,000 people directly in 2015 alone. Of the 500,000, more than 30,000 were helped with nutrition programs – particularly saving lives via the prevention, detection and treatment of malnutrition, in particular during and following disasters and conflicts. “Action Against Hunger continues to respond to these pressing issues and we want to reach more people to help and support us as we unlock children’s potential and possibly give them something to look forward to in the future,” says Javad Amoozegar, country director for Action Against Hunger Philippines. “Restaurants Against Hunger makes me realize that our craft goes beyond mere cooking, it also transforms into a stronger cause that enables us to have a chance to make someone’s future healthy,” Chef Roland Laudico says. Over 103 establishments, including branches, have signed up to be a part of the campaign – and Action Against Hunger hopes that more restaurants sign up before December 15. “It’s high time that we address this issue together and put up an advocacy that really encourages people to help fight malnutrition in their own ways—-- a simple act of ordering a dish can make a big difference,” says Amoogezar. “High national stunting prevalence rates in the Philippines, along with very modest progress in stunting reduction over time, makes stunting one of the biggest challenges the country faces as it economically develops. Stunted growth is not only about what we can see with our eyes but it also about poor intellectual development. Stunting is more than just a health issue as it has an impact on adult productivity and Philippines’ future. As stunting is a big challenge, it calls for a big effort among all Filipinos. Each one can make a meaningful contribution,” says Amoozegar. This campaign is about channeling the Filipino passion for food into life-saving impact against hunger and child malnutrition. 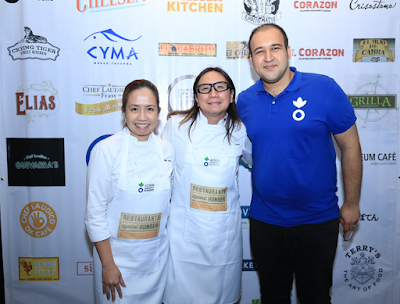 Dine in these participating restaurants, order their DISHES THAT FEED MORE, and give children a healthier future: 8 Cuts, Beni’s Falafel, Chelsea Grand Café, Chelsea Kitchen, Chotto Matte, Corazon, Crisostomo, Crying Tiger, Cyma, El Cabrito, El Chupacabra, El Corazon, Elias, Feast, Felix, Florabel, Green Pastures, Grilla Filipino Cuisine, Guevarra’s, Izakaya Sensu, Kabila, Manam, Melt Grilled Cheesery, Mexicali, Museum Café, OK Café, Ooma, Potts Point Café, Providore, Saboten, Señor Pollo, Simple Lang, Stella & Rocket Room, Terraz Bistro & Meetings, Terry's Bistro, The Café Mediterranean, The Corner Tree Café, The Old Spaghetti House, The Shrimp Shack, and Wild Ginger. Together, let’s make every dish truly count. The ongoing campaign ends on January 15, 2017. Registration for restaurants is open until November 30, 2016. To register and get more information about the campaign, visit the website www.restaurantsagainsthungerphilippines.org. Help alleviate malnutrition in the Philippines by spreading the word on the campaign with the hashtag #RestaurantsAgainstHungerPH. Follow the campaign on Facebook @RestaurantsAgainstHungerPH; Instagram @RestaurantsAgainstHungerPH; Twitter @EndHungerPH for updates. Follow the official Facebook page @ActionAgainstHungerPH and visit the website www.accioncontraelhambre.org/es/filipinas for more information about the organization.